Pomona College, incorporated October 14, 1887, held its first class in this small frame cottage on September 12, 1888. Those in attendance consisted of a mere handful of eager students, five faculty members, and the president, Professor Edwin C. Norton. Five months later, in January 1889, the college moved to an unfinished boom hotel on a plot of land in the town of Claremont. Southwest corner Mission Boulevard and South White Street, Pomona. If look for the actual building, you will not find it. 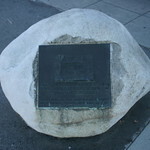 The only thing you will find is a rock with the landmark plaque which is right next to Angelo’s Burgers.